Adam JezardSenior Writer at Formative Content. Can the world afford Bitcoin? caused its value to balloon. But generating Bitcoin requires a truly staggering amount of energy. power a house for a month. 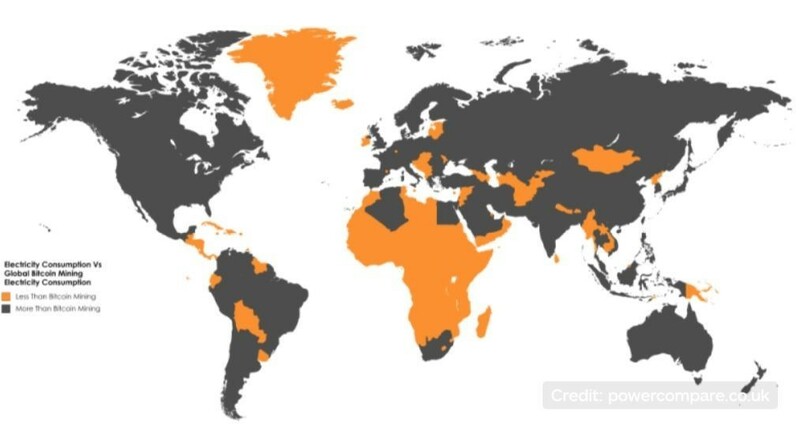 country the size of Ireland, Serbia or Bahrain. Bitcoin mining's energy use is reportedly growing at a rate of 25% per month. 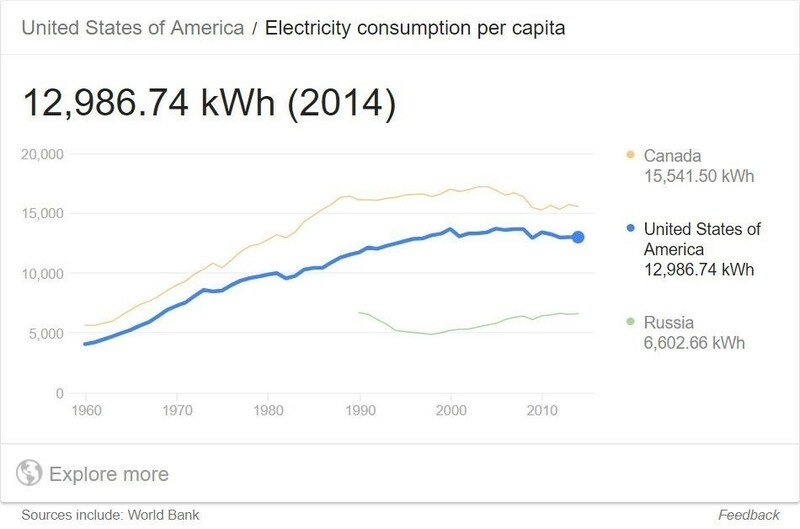 At that rate of growth, it will consume as much electricity as the US in 2019. And by 2020, bitcoin mining could be consuming the same amount of electricity every year as is currently used by the entire world. be spent on operational costs, including electricity bills. avoided or ignored by financial wizards and policymakers. world afford it in environmental terms? Bitcoin is earned by generating blocks, chains of transactions, verifying transactions are correct, and answering mathematical puzzles. While it sounds confusing, the whole system depends on an open, or “distributed”, electronic ledger that, in theory, eliminates the risks of fraud and theft, although there have been cases of huge Bitcoin losses due to alleged criminality. A new chain is created every 10 minutes or so and, according to a Business Insider article, the use of complicated and energy-intensive algorithms are part of a deliberate ploy to guarantee a degree of exclusivity. “Bitcoin trades use a lot of electricity as a means to make verifying trades expensive, therefore making fraudulent transactions costly and deterring those who would seek to misuse the currency,” Business Insider said. costing €39 of electricity (at current Dutch consumer prices)." As the average US citizen used 12,986.74 kWh of electricity in 2014, on that one November day in 2017 alone the power needed for the number of transactions was equal to the annual electricity usage of about 5,850 Americans. 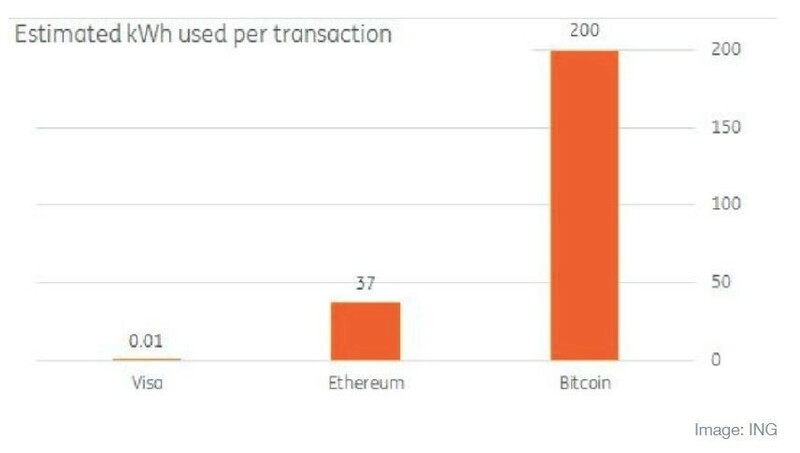 Bitcoin also uses a lot more power when compared with other transaction systems. A typical Visa card payment, for example, requires 0.01 kWh while another cryptocurrency, Ethereum, uses 37 kWh. users, but for the rest of the planet. of energy-consuming algorithms to drive the Bitcoin mining process means we are burning fossil fuels just so transactions can happen. And this is not good for the planet or our health. lungs and bloodstreams of animals and humans and cause serious illnesses, byproducts from power generation include toxic nitrous oxide and sulfur dioxide emissions, as well as carbon dioxide, one of the main gases linked to global changes in climate. Is the digital world sustainable? power generation to run the data centers at the heart of the modern economy. According to 2013 statistics, Google’s data centres used enough electricity to consistently power 200,000 homes, while the amount of power needed to run a large data centre would run a small US town. And as we move to driverless cars and other data-intensive “internet of things” technologies, the demand for energy will only increase. the same time needs to be the subject of urgent discussion.